Rudy D. Beck practices primarily in the areas of estate planning and elder law. 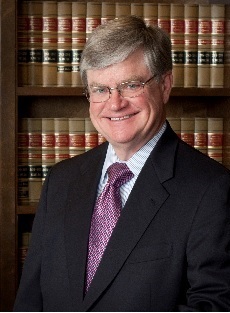 As a result, he typically deals with Medicaid planning, asset protection planning, long-term care crisis planning, probate and trust administration, guardianships, the preparation of living trusts, wills, durable powers of attorney, asset protection trusts, the formation of family limited partnerships, limited liability companies and insurance trusts, and applications for V A Aid & Attendance Benefits and Medicaid Benefits. Mr. Beck frequently presents seminars to other attorneys and to the general public concerning V A Aid & Attendance benefits and Medicaid Benefits, the use of trusts for asset protection planning purposes and the growing importance of Elder Law and an area of legal practice. Mr. Beck is a member of The Missouri Bar, the Estate Planning Council of St. Louis, and the National Academy of Elder Law Attorneys (NAELA). Mr. Beck received his BA degree from Knox College in Galesburg, Illinois in 1971 and his Juris Doctor degree from the University of Missouri-Columbia School of Law in May of 1974, and upon recommendation of the School of Law he was recognized in "Who's Who Among Students in American Universities and Colleges" in 1974. After serving as a 1st Lieutenant in the United States Army, he began his private practice in St. Charles, Missouri in December of 1974. Through April of 1975 to April of 1977, Mr. Beck was elected and served as City Attorney for the City of St. Charles, Missouri and at the same time, started to build his private practice. Chamber of Commerce, by serving as a member of the Administrative Advisory Committee for the St. Louis Catholic Archdiocese and being involved in numerous other community service projects. Mr. Beck was voted the Boys & Girls Club Man of the Year for 2002, and received the Champion of Older American Awards presented by SSM Healthcare System. In 2002 he was also elected to the Board of Directors for the Missouri chapter of the National Academy of Elder Law Attorneys (NAELA) and served as its Treasurer for the 2005-2006 year and president for 2008-2009 fiscal years. In April of 2005 Mr. Beck was selected for membership in the American Association of Trust, Estate and Elder Law Attorneys (AATEELA). Mr. Beck is the co-founder of two national organizations, Veterans Advocates Group of America (V AGA) and Elder Care USA and is co-author of the publication Don't Go Broke in a Nursing Home.